Discover a Maya paradise where their kings and courtesans reveled in direct contact with nature through meditation and relaxation. The natural wonders of the state of Yucatán are innumerable and some of the most important and unusual are the cenotes, or sinkholes. In the Yucatán there are over 3000 cenotes, with only 1400 actually studied and registered. The Mayas called them dzonot, which the conquering Spaniards translated as cenote. Geraldo Díaz Alpuche was a military commander in the 16th century who was greatly impressed with these underground caverns and pools, and he tried to explain the meaning of the word cenote in the Spanish language as meaning "deep thing". 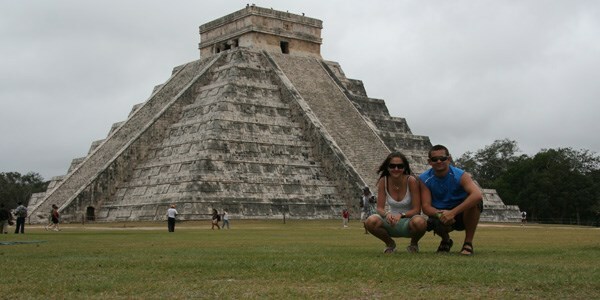 The Motul dictionary, a dictionary of Mayan hieroglyphics, defines dzonot as "abysmal and deep". Cenotes are magical, enigmatic and unique in the world and were once the only resource for fresh, sweet water in the local Yucatecan jungle. They were the sacred places of the Mayas for that reason, but also because they represented the entrance to the underworld. In 1936, a simple morphometry based classification system for cenotes was presented. Cenotes-cántaro (Jug, or Pit cenotes) are those with a surface connection narrower than the diameter of the water body; Cenotes-cilíndricos (Cylinder cenotes) are those with strictly vertical walls; Cenotes-aguadas (Basin cenotes) are those with shallow water basins; and grutas (Cave cenotes) are those having a horizontal entrance with dry sections. The classification scheme was based on morphometric observations above the water table, and therefore incompletely reflects the processes by which the cenotes formed and the inherent hydrogeochemical relationship with the underlying flooded cave networks, which were only discovered in the 1980s and onwards with the initiation of cave diving exploration. Cenotes are formed by dissolution of rock which creates a subsurface void, which may or may not be linked to an active cave system, and the subsequent structural collapse of the rock ceiling above the void. The rock that falls into the water below will then be slowly removed by further dissolution, creating space for more collapse blocks. The rate of collapse increases during periods when the water table is below the ceiling of the void, since the rock ceiling is no longer buoyantly supported by the water in the void. Cenotes may be fully collapsed creating an open water pool, or partially collapsed with some portion of a rock overhang above the water. 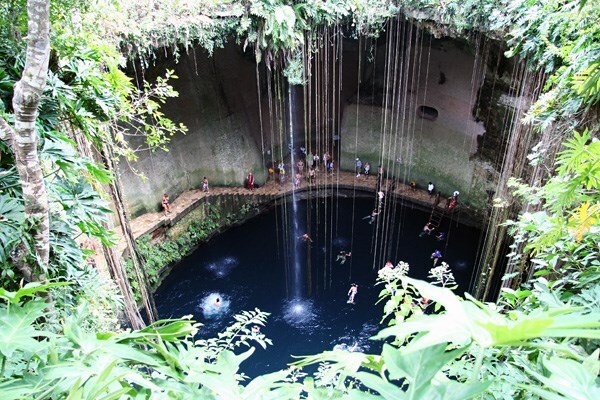 The stereotypical cenotes often resemble small circular ponds, measuring some tens of meters in diameter with sheer drops at the edges. Most cenotes however require some degree of stooping if not crawling to access the water. MATURE CENOTE - Over thousands of years, erosion gradually fills the cenote with organic and mineral debris, reducing its depth. The Sacred blue cenote also called Cenote IK-KILL, whose transparent water keeps the secret of the baths of the Maya kings and their courtesans, is the focus of this developing eco-archaeological park IK-KIL. Strategically situated in the heart of the archaeological zone of Chichen Itza, only a short stroll to the ceremonial centers. Surrounded by exotic plants, flowers and lush vegetation, birds, butterflies and forest animals cohabit in a healthy, armonious balance. It is ideal place for swimming in the clear blue water. Entrance is 70 pesos and it is open daily from 8 AM to 6 PM. 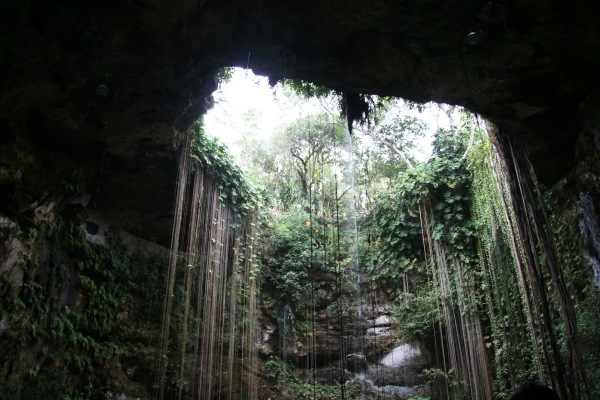 You can visit this cenote yourself or with guided tour - it is typically stop of a lot of organized trips. There is also an excellent buffet style restaurant here and bungalows for overnight stay. How many metres under surface you can find water level? Estimate how wide is this cenote? Put photo of you with GPS on the bottom of Blue cenote to the log. Please e-mail us your answers, don’t forget to specify the Earthcache name. Do not wait for the confirmation.